Do these NBA Finals horrors know no end? The 2018 Finals have been another reminder of Golden State’s ironclad grip on the league. A change would be nice. You don’t react emotionally to the Golden State Warriors. Do not bristle at their jeers or dwell on their protestations to the referees or scoff at them preening themselves after casually performing another impossible basketball feat because, almost without fail, the joke will eventually be on you. This is a mantra that, to some degree, applies to Tristan Thompson’s Game 1 ejection, Jordan Clarkson’s wide-eyed exasperation as he’s repeatedly coaxed into every shot his TI-81 game is not designed to make, and even LeBron James’ incredulous (and warranted) gesticulations as his time as a Cavalier once again draws to a close. Like most things under my byline, though, this is primarily about me. Griping about the state of the league in 2018 as a Spurs fan (on a Spurs blog, no less!) and occasional supporter of Anyone But Golden State is unquestionably a self-own. It reeks of the reactionary pettiness of an overly invested fan, the kind who can’t sit back and enjoy another non-San Antonio Finals replete with elite two-way skill and a modern, free-flowing offense. Greatness for greatness’ sake, if at the expense of a little balance and a rooting interest. And yet, two wins away from the third Warriors title in four years, which is just a few miracles off from being a fourth straight, certain emotions do attempt to creep in, not least of which is a grumpy, childlike kind of resignation: the Warriors are on the cusp of attaining that ever-elusive dynasty status (the same people often deny the Duncan-era Spurs for never having defended a title), and it may not be over anytime soon — not if they choose for it to go on. It’s part of this team’s self-correcting momentum, which combines Silicon Valley scorched-earth bravado with 19th century manifest destiny. More worrying, they stand to endure via the same mechanism that consolidated their league hegemony two years ago, with two core pieces gravitating back to the singularity rather than looking for the non-existent next best thing. Kevin Durant and Klay Thompson are both expected to stay in the Bay Area, the former this summer and the latter reportedly considering a discount extension, and no one could blame either one. Just as we’ve seen in their sleepwalks through the regular season, they are the greatest threat to their own undoing. This is why Durant’s decision in 2016 still feels like a heel turn, regardless of how much he tries to convince us it actually wasn’t and that he doesn’t care whether we think that it was or wasn’t. In narrative terms, it was like one of the fittest survivors inside a haunted house deciding to walk into the cellar and let a vampire turn him, or kindly asking the alien bug to take over his brain. To him, it may have seemed like a bold new chapter; for the rest of us, it became a story we’re now skipping to the end. Scary movies still attract plenty of viewers, even in their most cynical, unimaginative manifestations. There’s an appeal to their misanthropic nature and clockwork fatalism, the campiness, and many-formed pall of death that’s only ever moments away. No matter how predictable the plot may feel, the impossible odds that most of their characters take on, almost certainly in vain, there will always be a market for them. In this case, we get to watch the horrors, which are less a rickety house and more like the beautifully unsolvable Shimmer in Annihilation, humanize arguably the most superhuman figure in league history, laying a gauntlet of trials before him just so that he can take a seat with five minutes to go in a blowout (which is plenty of time for our Twitter timelines to overflow with people discrediting his legacy because of his Finals record). Does it help that his teammates don’t always know the score? Of course not, but bit characters in scary movies don’t make smart decisions. Movies give you a choice of diversions, though. The NBA Finals are more like a ride — nay, the ride — that we’re all willingly strapped in for, which means the last two or three games of the 2018 playoffs are still essentially appointment viewing. It’s just that many of us are far more interested in how the offseason could help make next June shake out a little differently. ‘To fight monsters we created monsters’ is a tagline from a giant robot movie from 2013 — nay, the giant robot movie of 2013 — but it could also be the ticket to something different in 2019, depending on what LeBron does. I know of one possible destination for him but, really, anywhere compelling is welcome at this point. 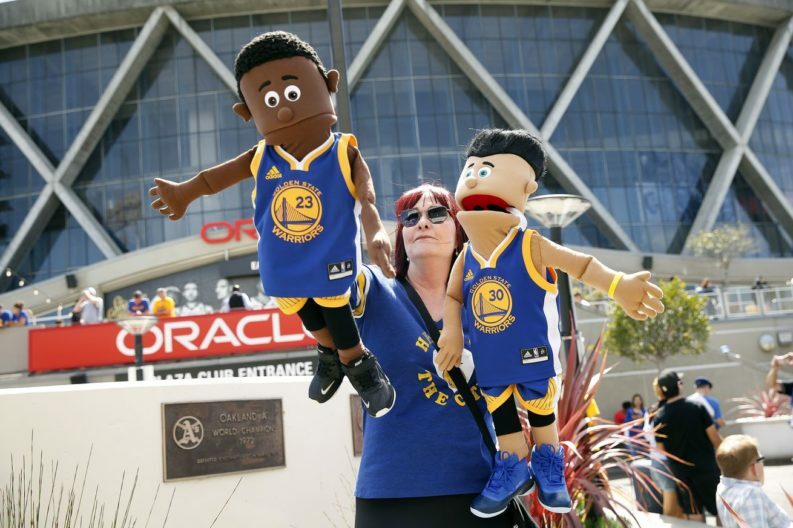 Is it a purely emotional reaction to the Warriors and the fatigue of it all? Sure, but I’m ready to ask for something new, even if it means playing myself.